This is a story about the formative years of my father, Bob Dorning, up until the early 1950s. It only touches on his religious works, which were a huge part of my parentÕs life. It is about the person, husband, father and breadwinner. Bob was born at Nhill in Western Victoria. His parents had moved there for work after arriving in Australia from South Africa in 1908. His father, Bernice Robert Dorning (November 21 1876 - February 23 1933), was a fitter who had come on the steamship Barrabool with his wife Louisa (nee Wild, November 6 1883 - March 18 1965) and their two children Bert and Leila. Bert started primary school at Nhill. Bernice was born at Widnes in Lancaster, a small town up the Mersey Estuary from Liverpool, then a bustling port and ship-building city. His father William was an engine fitter. It is likely Bernice learnt his engineering skills in Liverpool or nearby. At some stage he went to South Africa to join his brother to work on the diamond mines at Kimberley as a mine-pump fitter. His brother died within a year or two and it is said Bernice went prospecting for diamonds. He met Louisa Wild and they married in 1903 in Kimberley where Louisa had been born and grew up. Her youngest son Alby recalls her telling him she heard the guns of the Boar War. Work on the diamond mines would have been hot, hard work and dangerous. In Australia Bernice was always known as Bob, but in this article we will use Bernice. When they got to Australia Bernice found work in Nhill where it seems they remained for only a short time. The family has a letter written by Bernice to an old friend Albert back in England. The letter was dated May 1912 and their address was 110 Dryburgh Street, North Melbourne. From what is said in the letter it seems they had been there for a year of more. Bernice was working for an agricultural machinery manufacturer maintaining the plantÕs manufacturing equipment, rather than making the farm machinery itself. The family also has an employment reference for Bernice under a letterhead of Gastons Bros of Kensington (a short distance from North Melbourne) dated February 27, 1913. It says Bernice had worked for the firm for four and a half years and during that time he has given us every satisfaction and further has done all our engineering work and has proved himself an expert in our Engine Room. On a tape recording made by Alby Dorning for the 1983 Dorning Reunion about Bernice and Louisa it is said Bernice gained a job with an agricultural implement firm named Gastons as a fitter and turner and went to work in Nhill at their country branch for the next three years. However, as we have seen the family was living in North Melbourne in early 1912, so it is probable Bernice went to Nhill to work for Gastons mid-1908, but came back to Melbourne after a year or so and worked at the Kensington factory until the beginning of 1913. Information in this document is drawn from a number of sources, but principally from Alby Dorning, the youngest surviving son of Bernice and Louisa, Leanne Cairnduff (nee Dorning), daughter of Graeme Dorning (son of Bert) and Bobby Fingher who worked for my father from 1938 when he was fourteen to 1962/63 (apart from four years when he served in the Army in WWII), as well as from my memory of my family. THE FAMILY IS IN POSSESSION OF LETTERS WRITTEN BY BERNICE TO PARTIES IN THE UK. THESE LETTERS ARE IN POOR CONDITION AT THE FOLDS AND ARE IN NEED OF PROFESSIONAL REPAIR. WHEN REPAIRED THESE LETTERS WILL BE SCANNED AND PUT ON OUR WEBSITE FOR ALL TO READ. 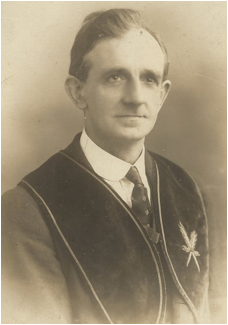 In his 1912 letter Bernice tells his friend Albert he had joined the United Ancient Order of Druids in Melbourne and had been a member for about two years. He says Since joining I have gradually gone up step by step and on Wednesday next the 29th May is the half yearly meeting and I am expecting to be elected to the chair as the Arch Druid of a particular lodge. It would seem BerniceÕs involvement with the Druids remained important for the rest of his life. There is a late formal photo of Bernice in an oval frame about 0.4 m high with an inscription which has been blackened-out. If the frame is held at different angles to the light it is possible to decipher the blackened-out inscription. It says AOD Tribute to the Memory of Brother Dorning PA Secretary. From the Members of the Holy Lodge, Number 89. AOD would mean Ancient Order of Druids and PA is likely to mean Past Arch. It is thought the inscription was blackened-out by Louisa after Bernice died because she didnÕt approve of his involvement in the lodge and the social drinking that may have resulted. Late photo of Bernice Dorning (date unknown) wearing an Ancient Order of Druids cape. The crossed quillÕs is the international symbol for a secretary. á Bernice says My work consists in keeping the engine and the machinery going and in running order as well as turning and fitting, making patterns and parts of the various implements manufactured É When we are busy I generally have a lot of overtime to do repairing machinery etc., but when we are slack as at the present it is left to run as long as it will and when it breaks down the men concerned have to lose time while it is fixed up. At the end of February, or the beginning of 1913, Bernice got a job at the Newport Railway Workshop (NRW) and the family moved nearby. He worked there until 1922. Alby remembers his father helped build MelbourneÕs first electric train – probably the Red Rattler which operated across MelbourneÕs suburban railway network from around 1919. When the train ran for the first time, Louisa took the children in the pram to see it go through Newport. A second letter in the possession of the family, written by Bernice, is dated May 13, 2013. It is also written to his friend Albert in the UK. However, the address on the letter is 35 Farm Street, Newport. It is a short follow-up letter to the one written a year earlier to which there hadnÕt been a reply. It was written not long after he started at the NRW. He says he has a new address and a new place of employment. He is working in the main tool room on a big lathe which does all the repair work for the different machines in the shop. He liked the work because it was varied. He says the place where they were living was close to the shops and more country than North Melbourne. As I grew up my father was a strong swimmer with powerful and precise strokes (breast stroke and Australian Crawl). He was also an excellent diver able to make graceful dives, including swallow dives and pikes, from heights equivalent to a 3 m board (often from a high river bank). It was often said dad had been a wrestler. When I was young we returned home from a trip to Williamstown making use of the then vehicle ferry across the Yarra near the Newport Power Station. I can recall my father telling us that when he was younger he often swam in the Yarra in this area and would swim across the river from bank to bank. He had pointed out a street running west from Douglas Parade and said he used to live in that street. We now know this was Farm Street. It is not known how or when Bob learnt his athletic skills. It must have been part of an organized program. It may have been when the family was living in Newport, or more likely later when they had moved to Footscray (see below) when Bob was older. Possibly there was a club associated with the church the family attended, or a club nearby which Bob joined. Bob left school when he was 14. Bobby Fingher recalls that many years later Bob told him he had wrestled in contests at West Melbourne Stadium (now Festival Hall) in Dudley Street, West Melbourne. Throughout this time babies were being added to the family. Alby was the second last. In all Louisa bore nine children with two, Alvira and Ray (born after Alby), dying at a young age. The remainder all lived to a ripe adulthood. 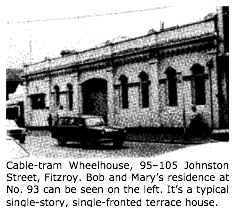 In AlbyÕs 1983 Reunion tape he says Work ran out with Kelly & Lewis in 1928 and a job in Gertrude Street, Fitzroy was offering so the family moved to Croxton where they attended the Northcote Baptist Church. It seems this job didnÕt come through, or didnÕt last very long, so Bernice set about earning money through his own efforts. Alby goes on Dad turned his hand to earn a few shillings É Some of these were collecting bottles, scrap metal, delivering firewood É and also branched out into ?? (inaudible), wrought iron and turned his hand to finishing and polishing brass ornaments and ash trays. 1914 Renault modified by Bernice. Originally it had a single bench seat and a tray with inward facing bench seats on either side. A cloth roof and sides were added. The cabin roof was much higher than modern vans. The photo was taken at Emmaline Street, Croxton. 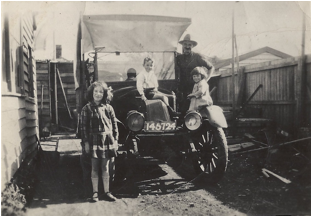 Ethel is standing in front, Alby is on the bonnet, Valerie on the mudguard with Bernice behind them on the running board. The family moved to 79 Emmaline St, Croxton (Northcote) in 1929/30. They lived there for 2 – 3 years and Alby started school. Ray died while they lived in Emmaline Street. At Croxton, the 1914 Renault was acquired. It would have been unusual at this time for a working class family to own a motor vehicle. In late October 1931 the family moved to 39 Forest Street, Collingwood (Alby one week short of six years). Bernice was to die unexpectedly fifteen months later. According to Alby there was a Melbourne summer thunderstorm which flooded the central roof gutter and water dripped into the hallway. Bernice climbed onto the roof in the rain to clear the gutter. As a result he caught pneumonia and died a week later on February 23, 1933 and was buried at Fawkner Cemetery. In AlbyÕs 1983 Reunion tape BerniceÕs eldest child Bert is recorded saying Dad was a good father, a good husband. He had many setbacks, but he still kept on going and trying. He was a good secretary at the DruidÕs lodge and when he passed away I never seen so many men gathered together around the graveside at that time. After this tragedy the family settled down to a difficult life during the Depression. Louisa was very religious and a devout Baptist and attended St MarkÕs Baptist Church in Clifton Hill each Sunday, taking the younger children with her. Apparently Louisa was known in the locality as a person who could prepare and layout a dead body and she would perform this role as required, presumably for a fee. It is family knowledge that LouisaÕs son Bert had a job throughout the Depression (as a bookbinder). However, this didnÕt mean life was easy. According to BertÕs son Kenny, Bert financially supported three families during the Depression – his own, his motherÕs and his wifeÕs parentÕs. Bob married in 1936. Ethel and Alby attended Gold Street Primary School (as did EthelÕs children, Bill and Ruth Marshall. My wife Dionne Wright taught there in 1980-82). Eventually the daughters met partners and married including Ethel who married at the end of 1939. After Alby took a job, aged fourteen, on a farm in Tooradin in 1939, Louisa moved out of Forest Street and went to live with her eldest daughter Leila in Horne Street, Elsternwick. Leila had married Ev. Bob must have had a job before the Depression where he learnt his tent making skills. Alby thinks it may have been with Evan Evans and Bobby Fingher recalls he was told it was with Gairs Canvas Goods in Elizabeth Street. In the early days of the Depression Bob was unemployed. In an attempt to generate a living Bob began making canvas goods at home and selling them at a stall at Victoria Market. There is a story that in the early days Bob would make one tent and after selling it had the money to purchase the materials to make another. Bob had a room in the house in Forest Street where he made his products. His stall was in the open sheds a few rows south of Victoria Street. Around 1932 Bob joined the Collingwood Free Breakfast Mission (CFBM), which at that stage, was in the hall at the rear of Dr Singleton's Collingwood Free Medical Mission Dispensary in 162 Wellington Street, Collingwood. How Bob came to the CFBM is not known. Also itÕs not known when Bob became a Christian. In an obituary by Alan Bush, pastor at Tweed Heads Church of Christ, it is said Bob was baptised in 1914 at the Newport Baptist Church. While the baptism may have occurred Alan isnÕt a good source as he would have met Bob only in the last years of his life when Bob was quite ill. On the other hand, Alby Dorning doesnÕt remember Bob going very often to the Clifton Hill Baptist Church with his mother who attended each Sunday. Moreover, Alby remembers a conversation at Bob and MaryÕs early home in Johnston Street, Fitzroy when Bob told him he had given up a lot to become a Christian including smoking. He said if his belief didnÕt prove true at least he would have lived a healthy and moral life. However, if his faith was true he would go to heaven. I hadnÕt known my father had been a smoker. If so, him giving up would likely to have been as a young man around 1930. If Bob didnÕt attend the Clifton Hill Baptist Church itÕs possible he converted at the CFBM. AlbyÕs account is corroborated by Bobby Fingher (see below for more about Bobby) who, of a similar age to Alby, heard the story from Bob much later and in very different circumstances. Like Alby, Bobby was much younger than Bob, but he and Bob established a firm friendship. Bobbie recalls Bob telling him that when he was young he was a bit of a wild man, but when he became a Christian he changed his ways and became a very different person. At the CFBM Bob met Frank Smith and they became close lifelong friends. How Frank, who lived in West Brunswick, came to the CFBM is also unknown. Frank worked at the Victorian Tramways in the city as a draughtsman. After work on a Friday he would go to Victoria Market and help Bob sell his tents. Soon after Bob came to the CFBM, May Smith (nee Gower) brought her friend Mary Holian to the CFBM after Mary had converted from Catholicism to Protestantism at the South Yarra Church of Christ. The four quickly paired off and May married Frank on February 23, 1935 (Wesley Church, Lonsdale Street) and Mary married Bob on April 18, 1936. The CFBM was to play a huge part in the lives of the two couples, but thatÕs another story. Bob and Mary married at St MarkÕs Baptist church in Clifton Hill (Ethel and Bill Marshall married there also on November 11, 1939). 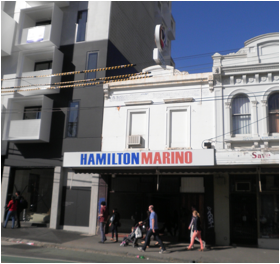 After Bob and Mary married they moved into 93 Johnston Street Fitzroy, a few doors west of Brunswick Street, beside the Cable-tram Wheelhouse and opposite the Regent Movie Theatre. My sister Judith was born in 1937 (October 25, 1937 – September 12, 2009) and they lived there for about six years when they moved into their newly-built home at 21 Wallis Avenue, East Ivanhoe. Bob stopped making tents at Forest Street and must have made them at Johnston Street. Bob had inherited the 1914 Renault and garaged it in a shed at the rear of the block. Alby would spend a lot of time with Bob and Mary although he was seventeen years younger than Bob (Alby aged 11 at the end of 1936). He often went to Victoria Market with Bob and Bob would sometimes give him sixpence to mind the stall. Alby says that around this time his mother was often ill and would spend time in the WomenÕs Hospital in Carlton, so Alby would go and live at Bob and MaryÕs. Life was free for kids (although they were very poor) and they could roam without fear. Forest Street was close to the junction of the Merri Creek and the Yarra River and to DightÕs Falls. It is two streets west of Hoddle Street running south off Alexandra Parade under which runs the large (Reilly Street) storm water drain which discharges into the Merri Creek. 39 Forest Street was demolished for the Eastern Freeway. However, Collingwood and adjoining Fitzroy were tough places for teenagers to live. There were the Collingwood kids and the Fitzroy kids with the dividing line being Smith Street. Alby said the 1914 Renault had little power. Bob used it to transport his goods to Vic Market. He would drive along Johnston Street and then up the gentle hill of Elgin Street. The Renault slowed down so much young lads on their bikes would chase and catch it and get a free ride holding onto the rear. Judging from appearances the Renault was the same model as the famous Taxis of The Marne where more than 600 Parisian taxis transported 6000 soldiers to the frontline for the decisive Battle of The Marne which halted the German advance at the beginning of WWI. This model could maintain an average speed of 25 kph! At some stage when at Johnston Street, Bob purchased a Dodge ute. It replaced the faithful Renault in the shed which went to its happy hunting ground in the sky. For some reason Bob had the ute painted blue and it was thereafter known as the blue Dodge ute. In 1941 Bob sold it to his older brother Bert who was about to move his family from Footscray to a farm at Narre Warren East. It would appear that in the second half of the 1930s before WWII, Bob with his new family, was able to make a living, but it was still tough. In 1938, he moved his small manufacturing operation into a two-story shop at 512 Swanston Street, Carlton. Alby was there when Bob was moving in and helped clean up. Apparently the previous owner liked a drink and there was a huge mess under the tables. Alby found a bottle of beer amongst the empties and as Bob was a teetotaler and he was too young to drink he took it out into the street and offered it to a passerby who happily accepted it. When the young Bobby Fingher (b. September 13, 1924) started working there a few months later, he recalls Bob only occupied the front two thirds of the ground floor. In the rear one third, and upstairs, lived a lady and her two children. The lower back third was their kitchen and upstairs was their living quarters. When Bobby joined the Army in 1942 this family was still living there. When he returned and began working for Bob again in 1946 they had gone and Bob occupied the two floors. I have a memory my father told me there was another tent maker at Vic Market who had died and his widow suggested to Bob he move into 512. It could have been a mutually beneficial arrangement. Bob was later able to purchase the property. It is possible Bob purchased the property towards the end of WWII, but this is speculation. Bobby Fingher started working for Bob in the second half of 1939 before WWII started. Some time later my father told him he wasnÕt able to pay his wages. Bobby found a job in the City, but returned to work at 512 early in 1940 after the war had begun, and Bob was getting work for the Australian Army. Until he joined the Army in October 1942 he was the only employee working for Bob. When he left, Bob had a female machinist working for him. It would seem from these circumstances BobÕs business was still struggling in the in the early days of the war. Bob kept the stall at Victoria Market going for a few years. When Bobby finished up to go into the Army he was earning £2 per week. 512 Swanston Street, Carlton, today. The tents Bob made for the Market and the Army were 8 x 10 Gable Tents (with the dimensions being in feet – 2.5 x 3 m). They had vertical sides about three foot (80 cm) high and then inward sloping roof panels which met in a gable six feet above the ground. Above this gable roof was a separate cover called a fly which was supported by a horizontal ridge pole such that there was a four inch (10 cm) gap between the fly and the roof with the fly extending beyond the sides so rain would run off away from the tent. One end was closed and entry was through a fold in the other end. The early gable tents sold at the Market were made from calico (a light material) and later ones, and those for the Army, were made of canvas. Bob also made marquees, ÒQ tentsÓ, for the Army – large square or rectangular tents with sides above head height and high pyramidal roofs, which were used for stores, kitchens, medical care and other uses. He also made tarpaulins. It was said by contemporaries that during WWII Bob had a contract with the Department of Defence to supply the war effort that established his business. However, as has been shown, the work early in the war wasnÕt substantial. Nevertheless, it did increase and BobÕs business prospered from the war. When Bobbie started working for Bob again in 1946 there were three large sewing machines along the left of the ground floor and two smaller machines on the right and there were five employees working for Bob. A number of these were friends, relatives, or members of the Mission Hall, e.g., Bill Marshall Snr. and Frank McIntosh and ?? who had a glass eye and who would tell gullible ladies he had come almost to see with the glass eye, but then he would lose it, or break it. v) cars purchased by Bob after WWII: 1947 Ford Mercury (a US officers car), 1949 Single Spinner (new), 1952 Twin Spinner (new), 1953 Customline (new). Bob was obviously a successful businessman. He built a business in the Depression, which wouldnÕt have been easy. I would judge my family to be well-off, but not wealthy or rich. Nevertheless, my parents were able to take holidays in Australia and overseas, buy another canvas business and Bob would have given 10% of his income to the church. The earliest firm date we have for when Bob and Mary were living in Wallis Avenue is February 1942 when Michael Beavis spent the weekend at their new home after coming to Melbourne to join the Airforce. On the Monday morning Bob drove him into the City to the RAAF Recruiting Depot. Robert was born at the end of 1944 (December 6) and Rhonda was born at the end of 1948 (November 30). á the auto tent became his main product after the war replacing the gable tent. The auto tent was square or rectangular, with a shallow pyramidal roof. The sides were above head height and made of white light canvas and the roof was of a heavier green canvas. They came in three sizes: 9 x 9, 12 x 12 and 12 x 18 (dimensions in feet). Bob had a manufacturerÕs stencil R. Dorning, Maker, 512 Swanston Street, Carlton. which was stenciled on a wall of the tent. á Tarpaulins and custom truck covers. Mayne Nicholas had special red covers to prevent them being stolen. Bob made covers for CUB Brewery (across the road), but didnÕt put his manufacturers stencil on them so he wouldnÕt be identified as the manufacturer. á water bottles, The Dawn, for car bumper bars. á stockmenÕs coats. Bob used a travelling salesman who worked for Kinnears Ropes and who represented Bob on the side. He would travel throughout country Victoria and take orders for BobÕs products. StockmenÕs coats were popular. Raw linseed oil was rubbed into the canvas before manufacture. á play tents for children made of calico with a stencil on the side. The first was a coloured stencil of an american red indian riding a horse with a rifle in his hand chasing a buffalo. The second had a coloured image of Hopalong Cassidy on his horse rearing on its hind legs. á specialised orders for 1000 tubular duffle bags for airforce personnel, show tents and a large order for the Snowy Mountain Authority of rubberized trousers and a loose top. 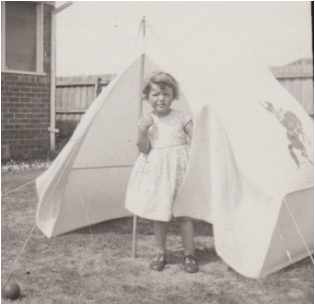 á Bob made one circus tent and hired a disused motor garage in Carlton for the purpose. WE HAVE BROKEN WRITING BOBÕS STORY AT THIS POINT DUE TO OTHER PRESSURES. WILL BE COMPLETED IN DUE COURSE. My father was a fervent Christian. I ended up an atheist which led to some argument between the two of us. Nevertheless, if heÕs right and IÕm wrong IÕm sure he is pleased looking down, to see I had the interest, and took the effort, to learn and tell his story. 1926 Oct 2, Bert marries Lillian at Newport FIRM DATE Ken Dorning, born in Footscray, lived in Chirnside Street. A house, not sharing. 1933 Feb 23, Bernice dies from pneumonia. Bob inherits 1914 Renault. Ken Dorning, born in Footscray, Chirnside Street (see Alby). A house, not sharing. Six years old when Bert purchased blue Dodge ute from Bob, 1941. Getting ready to move to Narre Warren East. Bert was the only one to have a job through the Depression, supported 3 families. Had to be released from Òessential labourÓ. My impression is Bert worked as a printer or book binder.